The Historical City of Maybod is part of the Tentative list of Iran in order to qualify for inclusion in the World Heritage List. With the recent inscription of Yazd, I am not quite sure how Maybod, another silk road desert city in the same region, would be able to position itself differently and subsequently provide a fresh perspective/OUV to the list. Highlights of the old city include the 2,000 year old Narin castle, an intact ice house, working qanats, a few badgirs, what is perhaps the most beautiful dovecote in all of Persia, and the Shah Abassi caravanserai, which also happens to be a component of the Persian Caravanserai - TWHS and quite possibly a part of the Silk Route - TWHS of Iran as well. Interestingly, I have observed that inscribing a site more than once seems to be something that Iran enjoys doing, i.e., Pasargadae - Persian Garden, Yazd - Persian Garden - Persian Qanat, Bam - Persian Qanat, as well as many others still brewing in the T-list. 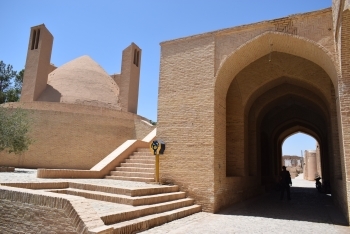 Maybod can easily be reached as part of a regular day tour offered in Yazd.